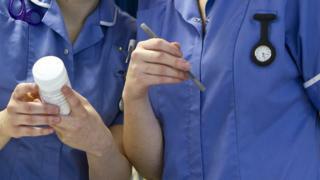 Female NHS staff in England earn nearly a quarter less than their male colleagues, figures show. The data covers more than one million workers in England from doctors and managers to nurses and cleaners. It showed that the average full-time female worker is paid £28,702 a year in basic salary. That compares to the £37,470 average pay for men - a gap of more than 23%. The total excludes bonuses and overtime that are paid on top of basic pay. Last month the BBC revealed 6.5 times as many male consultants as female received the top platinum bonus worth £77,000 a year. The data, compiled by NHS Digital for the government using mean rather than median averages, also provided a breakdown for doctors of all grades. It found a gender pay gap of 15% with male doctors paid £67,788 in basic pay, compared to the £57,569 female doctors receive. Want to find out the median gender pay gap at your company? Try the calculator below. If you can't see the calculator, click here. Dr Sally Davies, of the Medical Woman's Federation, said the findings were disappointing, but not surprising. "It reflects the fact that men are more likely to make it into senior positions. It is the same issue we have seen in the rest of the economy. "I think it raises serious questions for the NHS and government. I would like to know what they are going to do about it." A Department of Health and Social Care spokesperson said: "We are committed to ensuring that our hardworking NHS staff are rewarded fairly and equally for their work regardless of gender. "The department is working closely with NHS organisations to support them in closing their gender pay gaps and has committed to an independent review of the gender pay gap in medicine."